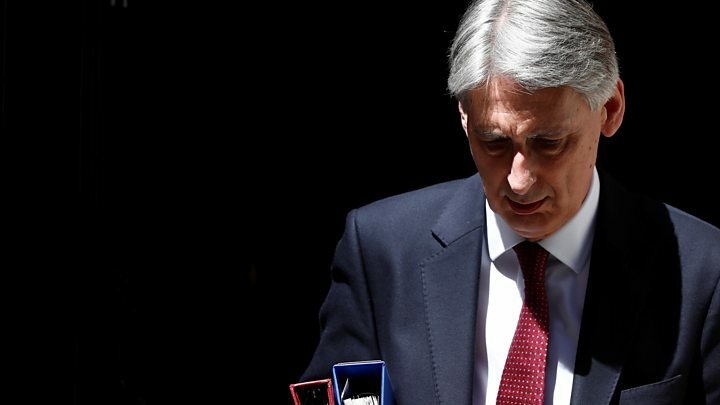 Any "transitional deal" in the period after Brexit must end by June 2022, the time of the next general election, Philip Hammond has said. But the chancellor said there must be "business as usual, life as normal" for Britons as the UK left the EU. "Many things would look similar" the day after Brexit - on 29 March 2019 - as the UK moved gradually towards a new relationship with the EU, he said. The EU has said it is too soon to discuss a transitional deal. A European Commission spokesman said: "We are about to discuss the specifics of separation and once this is done to the satisfaction of everyone, we may move to the second step." The UK is due to leave the EU at the end of March 2019 but there has been increasing talk of a "transitional" or "implementation" stage to smooth the process, before a new long-term relationship with the EU comes into force. This could mean a period during which some EU rules would continue to apply to the UK after it has technically left the bloc. Newspaper reports have suggested these could include the free movement of people, something that was seen as a key issue in the vote to leave the EU. Mr Hammond also appeared to acknowledge that it could mean new trade deals with non-EU countries could not be signed during that period. The chancellor told BBC Radio 4's Today programme the length of any transitional deal would "be driven by technical considerations". Beneath the surface, Chancellor Philip Hammond had been arguing for a transitional arrangement to avoid choppy waters in 2019. There is no longer any dissent in the ranks - that concept has been agreed by the Cabinet. In return, the chancellor has acceded to demands by ministers who voted to leave the EU that any transitional phase must be completed by the scheduled date of the next general election - June 2022. But have other disagreements so far escaped the political sonar? On Thursday, immigration minister Brandon Lewis said it was a "simple matter of fact" that EU free movement rules would not apply after 2019. Mr Hammond said this was correct because freedom of movement was an EU concept and the UK would leave the customs union and single market on 29 March 2019. But he said the question that needed answering was what happened next, so that British people and businesses could "get on with their lives" without "massive disruption". He said he hoped that, in the immediate aftermath, goods would "continue to flow across the border between the UK and the EU in much the same way as they do now". On whether EU citizens would continue to be free to enter the UK, he said it would be "some time before we are able to introduce full migration controls between the UK and the European Union". "That's not a matter of political choice, it's a matter of fact. We have to put in place quite a lot of new infrastructure, we will need a lot of new people, we will need new IT systems... This is going to take a while to deliver." He said Britons wanted to know they would still be able to "go about their business" after March 2019, from buying European goods to going off on holiday, adding: "The government's job is to make sure that our economy can go on functioning normally, that people can go about their businesses as usual... that is our focus." Some of Mr Hammond's colleagues who campaigned for a Leave vote have accepted that an "implementation period" after Brexit is likely. The Conservative MP and Leave campaigner Nigel Evans said any transition period should end as soon as the UK had arrangements in place, saying: "This is not going to be seen as a ruse whereby some people who might have liked us to remain in the European Union can see this as an opportunity to keep us half in. "That's not going to happen. We are, in all but one or two transitional arrangements, going to have left the European Union by March 2019." Shadow Brexit secretary Sir Keir Starmer said Labour had been calling for "appropriate transitional arrangements" which the chancellor "now appears to accept". "However, in light of the clear divisions this week within the Cabinet, I hope the chancellor was not merely speaking in a personal capacity," he said. "I also hope that this is the final burial of the flawed proposition that 'no deal' is a viable option." Lib Dem leader Sir Vince Cable said a transition period was only "kicking the can down the road". "All the problems associated with a hard Brexit, leaving the single market, leaving the customs union, they will simply be confronted two years later." Meanwhile, Malta's PM Joseph Muscat has said he is "starting to believe that Brexit will not happen", according to the Guardian.